EVAPORATES IN SECONDS. INCLUDES MICRO-BORE TUBE FOR HARD TO REACH PLACES. Size 200 ml. 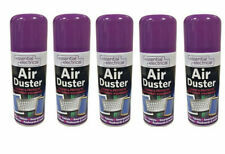 Air Duster 200ml Compressed Air Cleaner Can. Includes micro-bore tube for hard to reach place. 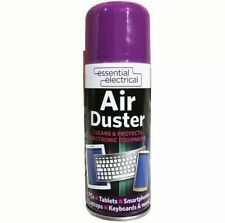 Compressed Air Duster Cleaner Aerosol Spray Laptop Keybaord Mouse 1-10 200ml Can. 200ml air duster spray can. Essential Electrical Air Duster Aerosol. 1 x 200ML air duster spray. EVAPORATES IN SECONDS. INCLUDES MICRO-BORE TUBE FOR HARD TO REACH PLACES. 3 x 400ml Compressed Air Duster. 3 x 400ml Compressed Air. Can Be Used To Clean Out Your Keyboard, Laptop Or Any Other Hard To Get To Places. 400ml Compressed Air Duster. 12 x 400ml Compressed Air. 12 x Cans Of Compressed Air. Can Be Used To Clean Out Your Keyboard, Laptop Or Any Other Hard To Get To Places. Pictures are for illustration purposes product may vary. 200ml Compressed Air Duster Cleaner Can For Laptop Keyboard Mouse Printers NEW. Condition is New. Dispatched with Royal Mail 2nd Class. 1 x 200ML air duster spray. Includes micro-bore tube for hard to reach place. This is not a choice of our own. Air Duster Aerosol 200ml. 1 x 200ML air duster spray. using an Air Duster to clean your electronics regularly you can extend the life of your tech. This is not a choice of our own. All queries replied within 24 hours. Air Duster Aerosol 200ml x 2. 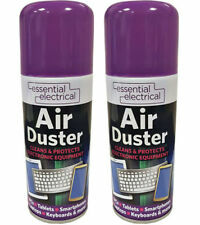 2 x 200ML air duster spray. using an Air Duster to clean your electronics regularly you can extend the life of your tech. AB - BT - DD - DG - EH - EX - FK - G - GSP - GY - IM - IV - JE - KA - KW - KH - KY - LL - ML -PA - PH - PL - TA - TD -TQ - TR - TS - ZU - ISLE OF MAN - ISLE OF WHITE. Mixing the ingredients is paramount to stop splatter and the clogging of nozzles! Aerosol Safety. Shake cans thoroughly, hold the can horizontally while shaking is the manufacturer's advice. Good results are easily achievable with these simple to use aerosols. 200ml Air duster. 4 X AIR DUSTER CAN 200ML. FAST DISPATCH. 2 x 400ml Compressed Air Duster. 2 x 400ml Compressed Air. Can Be Used To Clean Out Your Keyboard, Laptop Or Any Other Hard To Get To Places. We aim to resolve any problem as quickly as possible. 400ml Compressed Air Duster. 400ml Compressed Air. Can Be Used To Clean Out Your Keyboard, Laptop Or Any Other Hard To Get To Places. Air Duster Aerosol 400ml. 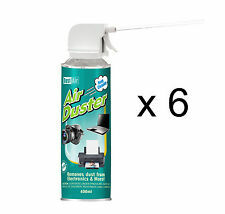 2 x 400ML air duster spray. using an Air Duster to clean your electronics regularly you can extend the life of your tech. Includes micro-bore tube for hard to reach place. AB – BT - DD - EH – EX – FK - IM – IV – KA- KW – PH – PL – PO – SO - TD- TQ - TR. Good results are easily achievable with these simple to use aerosols. Instructions on can. It is also wise to follow cleaning instructions of your device. 2 x 400ml Lazer Air Duster. 2 x 400ml Air duster. You get 12 cans of compressed air dusters which are 200ml each. even clean tight spaces in your car and house where you couldn't reach before this tool is just brilliant for stuff like that. buy one now and let the fun began. Instructions on can. It is also wise to follow cleaning instructions of your device. Evaporates in seconds. Includes micro-bore tube for hard to reach places. faxes and much more. base units. We have a dedicated team to answer any queries you may have. We aim to get your ORDER to you as FAST AS POSSIBLE! Instructions on can. It is also wise to follow cleaning instructions of your device. Instructions on can. It is also wise to follow cleaning instructions of your device. For Unwanted, Non-Faulty Goods. • Compressed gas to remove debris and dirt from hard to reach areas. Compressed gas to remove debris and dirt from hard to reach areas. Extension tube included. 400ml can. Instructions on can. It is also wise to follow cleaning instructions of your device. base units. For Unwanted, Non-Faulty Goods. COMPRESSED AIR DUSTER SPRAY CAN - 200ml. 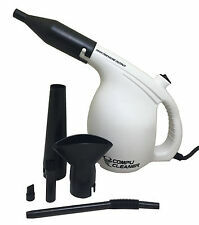 Non-Invertible spray Duster. Ozone friendly. You will be amazed at how easy and thoroughly it can clean any device. Use the supplied 'straw' for pinpoint accuracy and for directing the air into tiny nooks and crannies. Compressed Air Duster Can 200ml. EVAPORATES IN SECONDS. INCLUDES MICRO-BORE TUBE FOR HARD TO REACH PLACES. Set Includes- 6 x 200ml Air Dusters. 400ml Compressed Air Duster. 10 x 400ml Compressed Air. 10 x Cans Of Compressed Air. Can Be Used To Clean Out Your Keyboard, Laptop Or Any Other Hard To Get To Places. HiPoint 350ml Can Air Duster. Hi Point Air Duster, Compressed gas to remove debris and dirt from hard to reach areas. Larger size disposable can gives you great value. 100% ozone safe. Provides potent dust-removing power for practically any task. 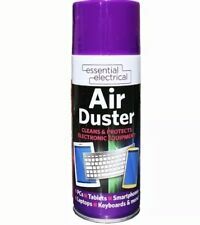 Air Duster Ecomoist (400ml), Excellent for Keyboards, Printers, Computer Co... .